Kyauk Taw: The most ancient city of Arakan, known historically as Danyawaddy, which existed in the 6 century BCE, was destroyed by bulldozers for construction of a railroad that passed over the walled palace grounds, said a historian in the region on the condition of anonymity. He said, "We submitted an appeal letter to the minister of railway three months ago, asking them not to construct the railroad over the ancient palace of Danyawaddy because it is a precious historic site for Arakanese people, but they neglected our appeal. Now the railroad is being constructed over the ancient palace," he said. The authority started construction of the railroad in the last week and it is now passing over the site of the palace. "There are many alternative paths for constructing the railway to bypass the ancient palace, but the authority always plans to construct the railroad over the ancient city sites in Arakan State. Every Arakanese believes the government wants to destroy the invaluable Arakanese historic sites on the pretense of the railroad," he said. The current military government is not willing see such historic sites preserved in ethnic areas in Burma due to its plan of Burmanization. Because of this, the military authority is often trying to destroy such historic sites in Burma to remove them from public sight. He also said, "If the railroad is constructed near the Thari Chaung Creek, located between Kyauk Taw and Mrauk U Township, the railroad would be very useful for local people because there are many villages in that area. But now the authority is constructing the railroad in an isolated area." At the site of the Danyawaddy ancient palace, there are many features such as moats, city walls, and ruined Buddha statues. All are likely to have been damaged in the railroad construction. According to historical records, the historic sites of ancient Danyawaddy were active from around 2666 BCE to 788 CE. 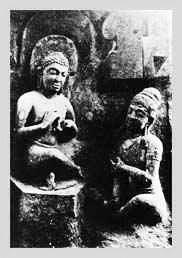 During that time, King Sanda Thu Riya cast Mahamuni Buddha and other precious images. The image of Mahamuni is now in Mandalay after it was forcibly removed and taken there when Burmese kings conquered Arakan in 1784. The authority has destroyed not only Danyawaddy palace but also other ancient sites in Mrauk U, to make way for the railroad. 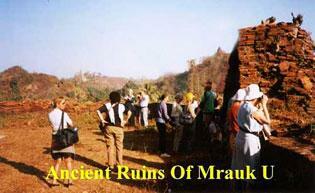 When the authority destroyed the ancient sites in Mrauk U, many local people, including monks, protested against the construction and succeeded in getting authorities to shift it to another path that bypassed many of the historic sites. The World Arakanese Organization, based in the USA, also sent a letter to UNESCO asking them to save the ancient sites of Arakan from further destruction at the hands of the military. In the letter, the WAO pointed out that Burma is party UNESCO's World Heritage Convention, and in 1996 the Mrauk U Archaeological Area and Monuments was submitted to UNESCO according to Paragraph 1, Article 11, of the convention for inclusion on the World Heritage List. To protect and conserve cultural heritage, the Burmese government has its own law called The Protection and Preservation of Cultural Heritage Regions Law, enacted in 1998. However, the current military government has been violating this law and has failed to abide by the World Heritage Convention. The WAO urged UNESCO to quickly investigate the railroad project and help save Mrauk U from further destruction by taking necessary measures.